The ICC has charged President Uhuru Kenyatta and Deputy President William Ruto with crimes against humanity, which they both deny. Mr Ruto's trial is due to start in The Hague next week. In one sense this is a calculated piece of political theatre. The issue of the ICC is generally agreed to have helped, not hindered, the electoral prospects of Uhuru Kenyatta and William Ruto. The debate in parliament will rekindle a sense of righteous anger among many here who feel that the president and his deputy are the victims, rather than the alleged perpetrators, of injustice. This is a notion that is gaining currency, not just in Kenya, but across Africa. In May, Ethiopian Prime Minister Hailemariam Desalegn accused the ICC of racist bias and of "hunting Africans." That kind of sentiment could prove useful in the weeks to come, to counter the potential negative impression created by pictures of Mr Ruto in the dock. Even if Kenya does eventually withdraw from the Rome Statute, it will not halt prosecutions currently under way. But it could embolden other African nations to follow suit. They were on opposite sides during the 2007 election but formed an alliance for elections in March this year, and analysts say the ICC prosecutions bolstered their campaign as they portrayed it as foreign interference in Kenya's domestic affairs. The BBC's Gabriel Gatehouse reports from the capital, Nairobi that even though the vote does not halt the cases, it sends a powerful signal of defiance to The Hague - a sentiment that is becoming increasingly popular, in Kenya and across much of Africa. 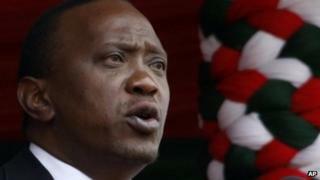 Kenya's parliament is dominated by the Jubilee coalition formed by Mr Kenyatta and Mr Ruto. The motion, tabled by majority leader Adan Duale, said the pair had been "lawfully elected" and the government should take steps to "immediately" withdraw from the Rome Statute, which established the ICC. The sentence stating that Kenya would "suspend any links, co-operation and assistance" to the ICC was removed during the debate. "Let us protect our citizens. Let us defend the sovereignty of the nation of Kenya," Mr Duale is quoted as saying. MPs from the opposition Coalition for Reforms and Democracy (Cord), led by former Prime Minister Raila Odinga, walked out of the debate, calling the motion "capricious" and "ill-considered". Kenya's withdrawal would not bring "honour to the nation and dignity to our leaders", Cord said in a statement. "Kenya cannot exist outside the realm of international law," it said. ICC spokesman Fadi El Abdallah told the BBC's Newsday programme that Kenya's withdrawal would have no bearing on the cases against the two men. "A withdrawal has an effect only for the future and never for the past," he said. If Mr Kenyatta and Mr Ruto failed to co-operate, ICC judges "may decide to issue arrest warrants against these accused", Mr Abdallah added. Amnesty International said the parliamentary motion was the latest in a series of "disturbing initiatives to undermine the work of the ICC in Kenya and across the continent". "Amnesty International calls on each and every parliamentarian to stand against impunity and reject this proposal," said Netsanet Belay, the group's Africa programme director, in a statement. In May, the African Union accused the ICC of "hunting" Africans because of their race.